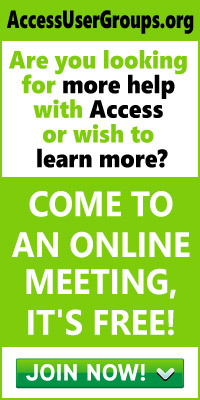 Take a Load Off Your Server with Access 2007 or Access 2003. Includes examples of using XML in ADO. Access 2000 allows you to generate persistent recordsets that can be stored on a local drive. This article demonstrates how to use these local recordsets to cache information for display in ComboBoxes or ListBoxes on Access forms. Figure 1 – The form that handles all the caching options in this article. The numbered points on the Left Hand Side of figure 1 will be used for reference throughout the article. An example of why this is important is a ComboBox that displays U.S. Post Office Zip Codes. If 25 local machines query the network database to get these Zip Codes every time they open a particular form, data traffic would slow the server unnecessarily. Using persistent recordsets, this can be handled locally. The data can then be updated every week, or on demand. 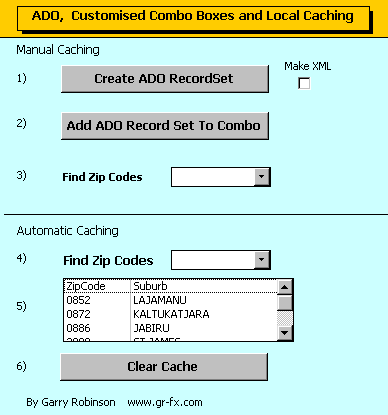 Caching with ADO is handled using a method that allows you to save the current recordset to a local file. Before you can use this method, you first need to define a recordset and connect to a data source as follows. The simplest method for defining this connection in Access 2000+ is using the CurrentProject object. Dim rst As ADODB.Recordset Set rst = New ADODB.Recordset rst.ActiveConnection = CurrentProject.Connection rst.Open "zipCodes"
In this example, a table of zip codes are being cached to a file on the local drive. Prior to saving the recordset, the cached file must be deleted it if it exists. On Error Resume Next Kill "c:\my documents\cache\" & "zipCodes.rst"
Kill "c:\my documents\cache\" & "zipCodes.rst"
When the file is saved to disk, there is only one format available using the standard version of Access 2000. This is a proprietary format called Advanced Data TableGram (ADTG). This is a binary format and is only decipherable using the open recordset options described in section 2 below. If you install version 2.2 of ADO on your PC, you will be able to use the open Extensible Markup Language (XML) format. This approach is useful as it is a very easy way to turn recordsets into this very important interchange format. Whether it actually benefits the caching process is debatable as files are 50% bigger and they require the users of your software to install the 6 megabyte ADO upgrade on their computer. In the sample database, there is a toggle button to switch between saving the file as XML or ADTG format. The save method for XML is as follows. Public Const CacheDir = "c:\my documents\cache\" Public Const FileType = ".RST" Public Const dataSource = "zipCodes"
Public Const CacheDir = "c:\my documents\cache\"
Public Const FileType = ".RST"
Public Const dataSource = "zipCodes"
Now we will retrieve the cached recordset and add it as a rowsource to the combo box. This is achieved by looping through the recordset and building a value string that we add to the combo box at the end of the recordset. For this example I have also added Row Headings to the output string. strRowSrc = rst(0).Name & ";" & rst(1).Name & ";"
strRowSrc = strRowSrc & rst(0) & ";" & rst(1) & ";"
To make this example more universal, I refer to the names of the recordset columns and names using the column number as follows recordset(ColumnNumber).name. Note also the use of a semi colon to separate the data columns in the row source. 3) Setting Up The Combo Box For Cached Recordsets. The manual caching system that I have described in steps 1 to 3 works OK except for two major issues. The first one is that the value list property will only accept a maximum length of 2048 characters. The other one is that the caching mechanism must wait until you build the full row source string before it displays any data. Testing the technique described in section 2 on 10000 zip codes showed that the combo box would have taken 1 minute to respond to the locally cached file. So this brings me to smart combo and list boxes. When I first ran into the 2048 character restriction when programming my data mining shareware, the Access error message pointed out that you could actually build your own function for passing data to the combo box. To find this elusive help, ask the answer wizard to display information on “Value List” and choose “Create A List Box that retrieves its rows from a function”. You will need this help to expand on issues in this article. The Code argument informs the function what the combo box Access requires in the current iteration and Col and Row which tells you what data to pass back for the column and row that the Combo Box wishes to display. Select Case Code Case acLBInitialize ' Initialize. In this initialization sequence, the function reads the cached recordset and stores the information into an array. As it is essential that the values in the array remain in place each time the function is called, the array is dimensioned as Static. Now the combo box uses the Code argument to ask the function to return other useful information such as the number of rows and columns in the data array.
' Generate unique ID for control.
' Get number of rows.
' Get number of columns. 5) List Boxes Work The Same Way. To reduce the complexity in section 4 of this article, I neglected to mention that we need to handle situations where the cached file does not exist. This handled in the ZipCodes function using error handlers as follows. The code that I use to rebuild the cache is exactly the same as illustrated in section 1) of this article. When the cache recordset is rebuilt, the module return to the next line in the smart combo box code by using a good old fashioned goto statement. To make this more universal, you would need to store your filenames in tables and your cache directory as optional location on the users PC. If you are using Microsoft Access and sharing its data amongst a number of end users, you will be passing all the information required by your forms from the server to the client every time you using a combo or list box on a form. Whilst this will generally be quite trivial when you are displaying a few rows from a lookup table, sometimes you may require more than a 1000 rows of data. If you are then to multiply this traffic by a large number of PC’s, the amount of data traffic can add up. By using some the techniques in this article, you can start to take a load of the server and start using those ultra fast local drives that PC’s come with these days. More importantly though are the different techniques that you now can use to enhance your applications. Firstly is processing of persisted recordsets locally in any type of application can make your application more efficient. The second lesson is how easy it is to use ADO to automatically generate XML files for your intranet/internet applications. And finally are the smart combo and list boxes which can be used to add some special functionality to your application.